Following an ankle injury, it is important to have the ankle evaluated by Dr. Patel for proper diagnosis and treatment. Diagnosis is made based on the history of injury and physical examination of the ankle. 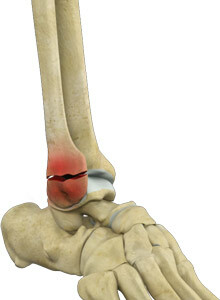 In addition, the surgeon may order X-ray of the ankle to determine the extent of the injury. Some ankle fractures are treated with a splint, which is placed on the ankle for few days until the swelling subsides. Once the swelling decreases a cast may be placed on the ankle to hold the broken bone in a specific place. Surgery may be needed to realign the bones before placing the splint. During surgery, Dr. Patel may place metal screws, plates, or rods to hold the broken bone intact until the healing happens. In some cases, crutches may be used to prevent the ankle from bearing weight.